This post is specifically aimed at EE customers, who face a particular problem with so called ‘third party billing’. EE have chosen to offer services via their ‘own portal’. These services don’t even offer the protection provided by Payforit! The advice for dealing with these scams is different to that for those instigated through Payforit, as responsibility for these ‘own portal’ services remains with the mobile network. This is confirmed by this document which explains the different rules and regulation regimes applied to Payforit services and ‘own portal’ services. Essentially, for Payforit services the regulator is the Phone-paid Services Authority. However OFCOM chose to exempt ‘own portal’ services from this regulation, on the basis that the network is responsible for providing access to the service. If you are the victim of one of these ‘own portal’ scams, you should complain direct to EE. If you are confident that you never consented to the charge, demand an immediate and full refund. Refuse to deal with the scamming company. 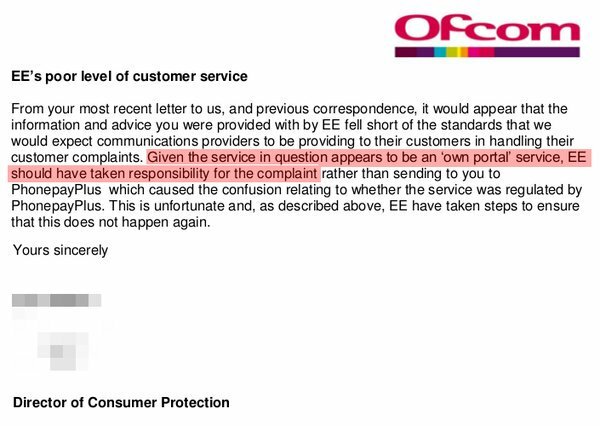 If EE don’t agree, ask for a deadlock letter which will enable you to take the matter to the ombudsman. These scammers are often able to say which device signed up to the service and when. Check your browsing history on the device and retain it to support you case. The signup procedure for these ‘services’ is extremely insecure, and easy to falsify using malicious code either on a web page or in an App, so even if your browsing history does show that you ‘signed up’, you probably didn’t. You can also use your browsing history to show that, after signing up, you never accessed the so called ‘service’. This page of comments on the EE forum has some interesting comments. Note that EE has not responded to refute the assertion that they are responsible for policing their ‘own portal’ services. The view of the Phone-paid Services Authority ( formerly PhonepayPlus) that they are NOT responsible for regulating these ‘own portal’ services is documented in this article. A PhonepayPlus spokesperson said Mobitrans appeared to be an ‘own-portal service’, which falls outside the scope of premium rate services regulation so is not regulated by PhonepayPlus. “This type of service is provided by the relevant Mobile Network operator (MNO), and in contrast with other services which are regulated by PhonepayPlus, it is the MNO in question who is responsible for customer service, complaints handling etc. rather than a third party service provider – it is therefore the responsibility of the MNOs to ensure that complaints about own-portal services are addressed.